Working through some example circuit simulations I finally gained an intuitive understanding of the voltage divider equation — it’s just a ratio, but I had never figured this out before. The voltage at A is equal to 1V·(R2 / R1 + R2), which is 1·(1/1+1) = 1·(1/2) = 0.5. Why? 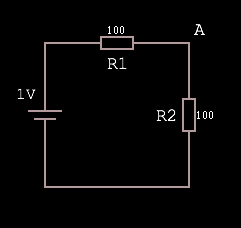 Because R1 + R2 represents the total resistance of the path, and as such the total voltage drop. Dividing R2 by the total produces a fraction representing the voltage drop over R2. Multiplying the input voltage by this fraction leaves us with the voltage dropped over just the R2 portion of the circuit, which must be VA because there are no other branches in the circuit. I was sure that someone else had already invented the decimal-friendly method of finger counting I came up with earlier this year. Not only is that true, they came up with a much cooler name for it — Chisanbop. Long shower queue at #kexhostel today, so I spent the time coming up with a better way of counting on fingers. Binary is not very ergonomic, my way is more limited but still gets you up to 99 using only fingers as state, and potentially 399 using arms as state too. What’s with the sideways eight as the infinity sign? We should use a dinosaur or something. In the beginning, at the time of the great flood, Noah went thru his ark after it landed, and found two small snakes huddled in a corner. Noah looked at these poor specimens - and said "I told you to go forth and multiply - why haven't you?" The poor snakes looked up at Noah and replied "We can't because we are adders....."
Noah looked a bit perplexed, and then proceeded to tear bits of planking from his ark. He went on to build a beautiful wooden platform. He gathered up the snakes and placed them on the platform, and joyfully told the snakes - "Now go forth and multiply, because even adders can multiply on a log table"